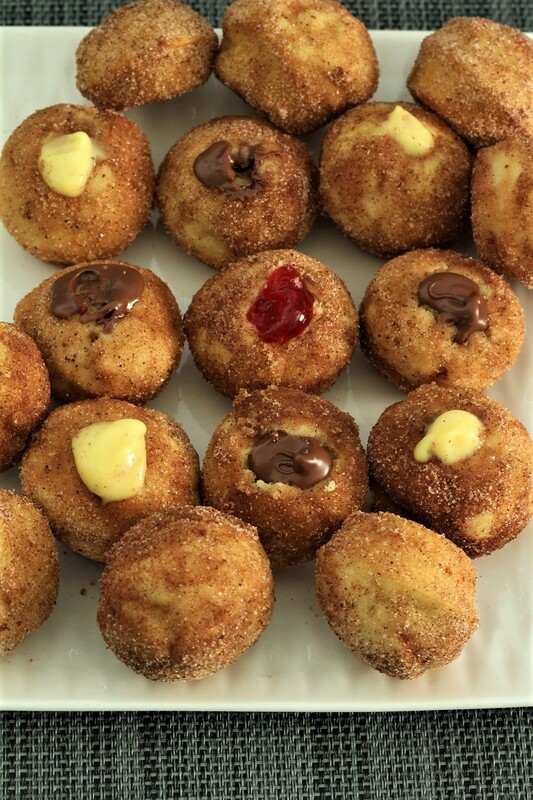 Nutella Churro Donut Bites are so easy to make. Your guests will be so impressed and think that you have been slaving away in the kitchen all day. Mix up a batch and put them in the oven. That’s right, no heating up the oil; bake, dip in butter and then sugar and cinnamon. I put vanilla pudding in some of my churro donut bites the other day because my husband is not a big fan of Nutella. I know, that is just messed up, but more for me! He is not a fan of hazel nuts, and so when we buy mixed nuts, I know that I will be eating all of them. That is okay, because I do like them. The problem with Nutella, I eat all of that too, and I try not to eat it all in just one sitting. These little Nutella churro donut bites are just right, especially if you eat 4 or 5. Ha ha. My husband like the churro bites with raspberry filling or vanilla and my son and I like the ones with Nutella. They are even pretty good without anything in the center, but I must say that I prefer the Nutella. How is the end of your summer going? I just cannot believe how quickly the summer went. It is so different to have the nights cool off. My husband and I went for a drive this morning at 7 AM. He likes to go up to the mountains where this farmer lives and buy whole milk, and it was 35 degrees. Brrrrr. Two things I do not care for, are 35 degrees and whole milk. I guess I milked too many cows growing up! I prefer coconut milk. But, to each his own. I do love getting away from the hustle and bustle of where we live right now. I was a little sad to see the trees, because they are usually so beautiful this time of the year. I think because it was so dry, they just were not the beautiful, vibrant colors that they usually are. Don’t get me wrong, the colors were still nice, just not as striking. So to do my cheering up, I will have a few Nutella churro donut bites. They are a little like the colors of fall. However, you can make them for any time of the year. They will be a nice treat and a big hit. I was also looking for some pumpkin pudding that they had last year, but when I looked at the store, apparently I was one of the few people that liked it and it must not have come back this year. I did think that pumpkin pudding would be delicious in the churro donut bites. You could put any filling in that you like. Ask your family what their favorite filling is and then one night, have fun making the Nutella churro donut bites. 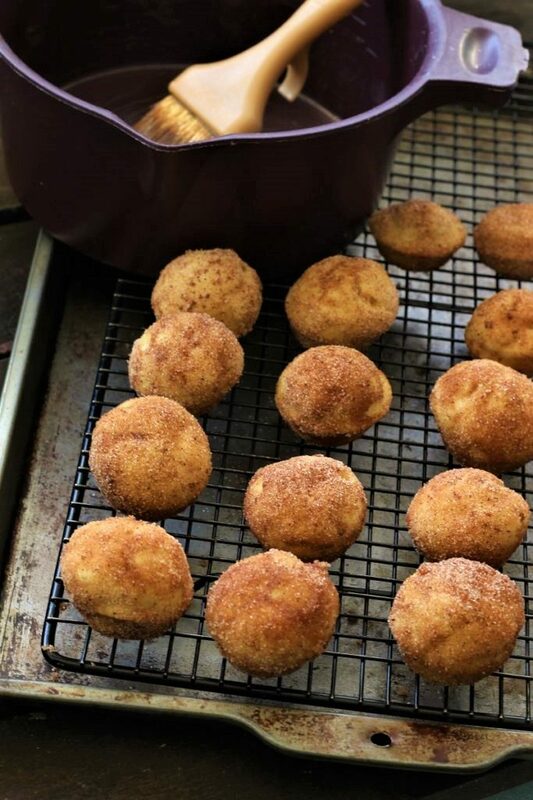 1- Use a frosting bag to fill the donut bites. 2- You can also scoop a little hole in the top with a strawberry core remover. It is a little spoon with little claws to remove cores, then fill the donut bites. 3- When using a frosting bag to fill the donut bites, do not overfill them or the donut bite will burst open. 4- Melt the Nutella just a bit before putting them in the donuts. 5- I put my donut bite into the pan with the melted butter, getting butter over the entire donut. 6- After dipping the donut into the butter, place it into the bowl with the cinnamon and sugar. 7- I place the churro bites on a wire rack with a cookie sheet underneath to help limit the mess. In a large mixing bowl, mix the flour, sugar, salt, baking powder, and baking soda. In the center of the dry ingredients, add the oil, egg, vanilla, and milk. Hand mix with a whisk. Whisk until the batter is nice and smooth. Grease one large muffin tin or a muffing tin that holds 18 small muffins. 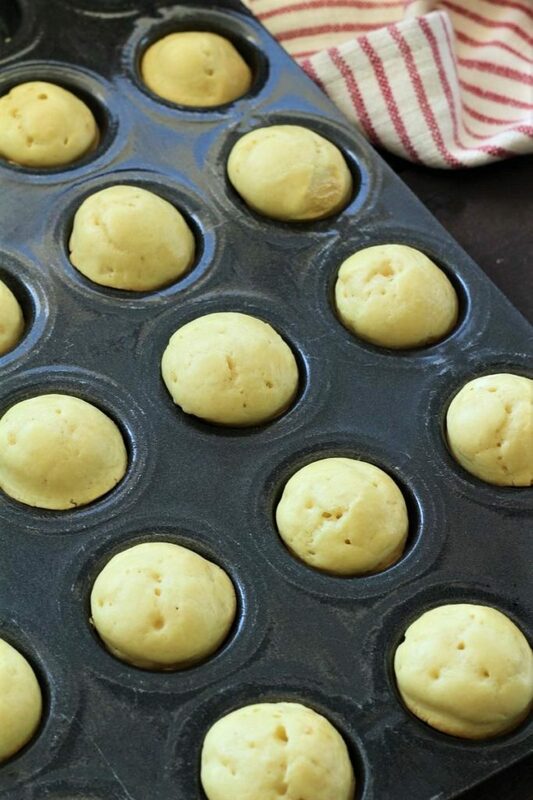 With a small cookie scoop or two spoons, spoon the batter into the muffin tin filling each one about ¾ full. Bake the small ones for 10 - 12 minutes and the large ones for 18 - 20 minutes @ 350 degrees, or until a wooden pick or cake tester comes out clean. Allow them to set in the pan for 4 - 5 minutes. Then remove them from the pan and place them on a wire cooling rack. Melt butter in the microwave in a microwave safe pan. (It isn't a lot of butter so it doesn't take long). With a pastry brush, brush each donut with a little butter. After brushing each donut with butter, coat each donut with cinnamon and sugar. Fill a frosting bag or a baggy with whatever you want to fill each donut with. If using a baggy, cut the corner off and place the bag into the center of each donut, squeezing a little into each donut. Thank you. They really are pretty good. Thank you for coming by and leaving a comment. Nutella is my WEAKNESS!! And any kind of carb for that matter, so these little nuggets of goodness would not last long around me!! Yes, that was my problem. I think that I may have gotten more than my share of the batch that I made. It was a good thing that I made some vanilla and raspberry for my hubby! Thanks for your comment. These look amazing and so professional. I think these would be a huge hit at a brunch party. I like the fact that they are baked, not fried; and of course, they also look delicious! Thank you for coming by and leaving a comment. One of the things that I like most about these is that they are not fried, but baked. And yes they are delicious. That crunchy coating makes these look so amazing! Thank you for coming by and leaving a comment. We love your link party, and so appreciate you. The nutella churro donut bites are pretty tasty.